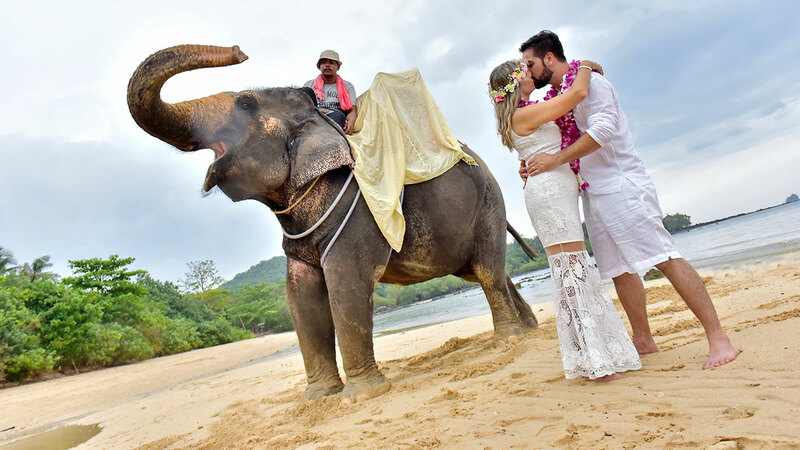 The wedding on elephants back is one of our popular wedding styles for a real romantic mood and worth to recall. On the bride and groom's wedding day, starts when organizer staffs (costumers, make up stylists and photographer) meet the bride and groom to dress up and lead them accompany with their followers to wedding place on the beach that was decorated marvelously. Groom and bride exchange their wedding rings as the sign that they are already married. M.C. or a representative gives blessing for wedding couple. As the just wedding couple are kissing the followers shower them with flowers. New wedding couple, witnesses and M.C. sign their names on the certificates. After that the wedding couple ride on the elephants' back to the next step, popped out marriage celebration champagne, plant a memorized tree and wave wedding flags. Wedding couple and their followers soar sky lantern and take photographs. End of the ceremony, everybody go back to the hotel happily and safely. 1 Elephant Escorted Ceremony with floral decorations.